Cape Town of the early eighteenth century was far removed from the more sophisticated establishments of the VOC in Batavia and Ceylon. It was still a relatively primitive place, whose outward image of neat and whitewashed houses conceal a less organised and pleasant reality. Cape Town was still a very rural settlement in appearance and nature. Many town dwellers had small vegetable plots on the slopes of Table Mountain and Devil’s Peak. A widow living on Signal Hill made a living selling milk in the town. Farms at Salt River and along the Liesbeek River provided vegetables, corn, milk and butter for the town. Saltpans were developed in the Tijger Valley ‘three miles from the Castle’, and the lower reaches of the Salt and Liesbeek rivers were extensively fished by the townspeople. 1713 The colony experience the worst Small pox epidemic in its history. Brought in a merchantman from India, it infect the town and the countryside. One quarter of the white population die. The disease ravage the Khoi people so, that, as a recognizable nation, they disappeared almost entirely. 1716 To cater for the safety of the growing town, a vacant erf facing Greenmarket Square is acquired, and the first Burgher Watch House is built on this site. It is designed in the style of an ordinary burgher’s dwelling. It would house a burgher watch under the command of a sergeant and a corporal who would patroll the streets at night. 1716, The Slave Lodge grow too small for the large number of slaves it has to accommodate. The Slave tree, A plaque on the centre isle of Spin Street indicates the approximate spot where the slave tree stood. This was the place where slaves were auctioned off. 1718 A building is erected in Spin Street, for the production on silk. Silkworm eggs are imported from the East. 1722 Fourteen of the DEIC’s ships are lost at sea, including many great merchantmen with rich cargoes from the East. In one storm, which arose in Table Bay in June, the entire Dutch fleet of India, (ten ships), which had been riding at anchor in the evening, were all ashore when dawn broke. 1724 Jan de la Fontaine is appointed as acting Governor for 3 years. 1727 Pieter Noodt takes the Office of the Governor of the Cape. Noodt is a brutal, overbearing man and disliked by everyone. 1728 A survey of the neighbouring coasts is done to find a more suitable harbour than Table Bay. The commission, which undertook the survey, report that Simon’s Bay (Simon Town) would offer better protection to at least eight or ten ships. The thatch-roofed dwellings began to disappear during this time, and in their place flat-roofed houses of one, two and three stories were erected. Vegetables were sold in Mark Plein, now Greenmarket Square. Single-storey houses, fronted by a long stoep, and with steps that gave access to the street, line the square. These houses had a stable-type front door, multi-paned windows and a centre gable. Interior floors were either red tiles from Batavia or Robben Island slate. The walls were whitewashed with shell lime and the roofs were made of bricks laid with lime mortar and covered with paving tiles, which were waterproofed with a coating of fish oil. To allow the rainwater to flow off the roofs into the road, passages four feet wide were left between houses. Houses were generally of a narrow frontage, and considerable depth. The growing town denuded the region not only of its indigenous human inhabitants but also of its flora and fauna. By the 1740s, with the exception of a so-called stag or doe, there were hardly any game within a radius of 25 to 30km from the Castle. Even the ubiquitous baboons were not seen as regularly in the gardens above the town. Natural timber also swiftly succumbed to the axe. Restrictions on woodcutting in Table Valley were introduced in 1687, but the scarcity of wood was a serious problem throughout the VOC period, driving up the cost of planks, boards and beams, and encouraging the shift from wooden to brick and plaster buildings. The destruction of the natural vegetation on the mountain slopes lead to the erosion of layers of topsoil, which were carried along the channels through the town into the bay. This resulted in shallowing, so that the houses built by the seashore, were now further from it. Time after time they were forced to lengthen the wooden quay. Although lacking city walls, its outer limits were marked by the naming of streets at its edges as ‘Buiten’ (Outside): Buitengracht, Buitenkant, Buitensingel. The Castle dominated the point at which the mountain stream enter the sea. Some of the burgher houses, which had been built near to it, were demolished. The planned physical separation of Castle and town is emphasised by an intervening stretch of open ground (the parade ground). The Parade ground was something of a no-man’s-land between the town and the Company headquarters. The town itself was established according to a strict grid pattern of streets (which today still forms the shape of central Cape Town) with regular square ‘blocks’ occupied by houses. This was even replicated in the layout of the Company gardens where pathways continue the street patterns and vegetable beds mirror housing blocks. Mountain streams were channelled into watercourses alongside the Company gardens, down the main ‘Heerengracht’ (Gentleman’s canal) and around the parade ground into the sea, in an imitation of Dutch urban canals. The main source of water was the well in the centre of Greenmarket Square, opposite the Burgher House. Winter rains played havoc with the parade ground. The surface of new streets laid out across part of this area were soon potholed, which became a danger to the unsuspected. The Governor dealt with this problem in the customary way, ordering burghers to supply, free of charge, the services of one slave for repair of the streets. The deterioration increased by the grazing of horses and cattle on the sidewalks and close to the water furrows. The authorities intervened and ordered farmers to outspan their wagons on the Boere Plein (Heritage Square). Householders are supposed to clean the street in front of their own houses. Since there were no organised sanitary services, the execution of these regulations became the duty of the slaves. 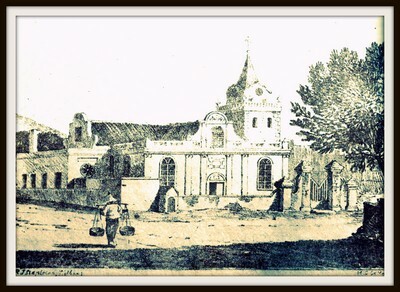 1737 The Dutch Reformed church buys its first organ from Governor Jan de la Fontaine. 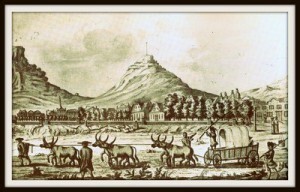 1739 14th of April Hendrik Swellengrebel, succeeds Adriaan van Hervel, as Governor of the Cape, and Ryk Tulbagh is appointed as Secunde (2ND in charge). 1743 The construction of a mole is started in Table Bay. It was abandoned after three years, due to a lack of funds. The site has ever since been known as Mouille Point. January Baron Gustav Willem van Imhoff, Governor-General of Netherlands India, arrives at the Cape. He was one of the ablest men ever to hold this office. He was given, not without some results, the impossible task of putting the Company’s house in order in the East. The Governor-General ordered the erection of two new churches, one at Roodezand, now Tulbagh, and the other at Zwartland, now Malmesbury. Although there were many Lutherans at the Cape, they were not granted permission to have a resident clergyman. The few Roman Catholics in the Colony were strictly prohibited from practising their faith in any place other than their own homes. The Governor-General, selected a site for a refreshment station on the southern shore of Simon’s Bay, and in the course of time the village of Simonstown was established there. He granted the farm, Imhoff’s Gift, between Fish Hoek and Kommetje, to a settler, so that more farmers might be encouraged to settle in the area. 1744 The construction of Fort Knokke (present day Woodstock Station) on the eastern side of the Castle begins. This fort, together with the Imhoff and Chavonnes batteries, was designed to protect the seaward side of the Castle from enemy entering the Bay. 1745 A new drostdy is established in the southwestern district near the confluence of the Korenlands and Breede Rivers. A settlement was laid out, and later grew into the town of Swellendam. The town was named in honour of the Governor and his wife. 1725 – 1750 Nearly nineteen hundred ships anchor in Table Bay in this period. Three-quarters were Dutch, and most of the foreigners were British. 1749 Sunday 20th April, Ships of a homeward-bound English fleet anchor in Table Bay, and when the commodore asks permission for his chaplain to conduct a service in the church, the authorities consent at once. 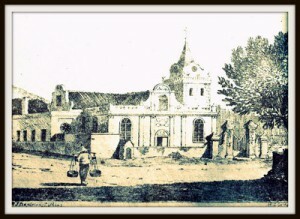 The divine service was held according to the rites of the Church of England in the Groote Kerk on the Heerengracht. 1750 The regulation against smoking pipes in the street had been so generally ignored that the Burgher Council, fearful as ever of the fire hazard, recommends that the Government move all taprooms to the south-eastern side of the town which, with its many taverns, canteens and other drinking places became known as the ‘tavern of the seas’, during the seventeenth, eighteenth and early nineteenth centuries. The ‘Tavern of the Seas’ was a place to rest and be merry, and like good innkeepers, the people of Cape Town were merry along with their very well paying guests. 1751 27th of February Governor Hendrik Swellengrebel retires.